New Madora Bay Land Release! It’s no secret that large blocks are getting harder and harder to come by. 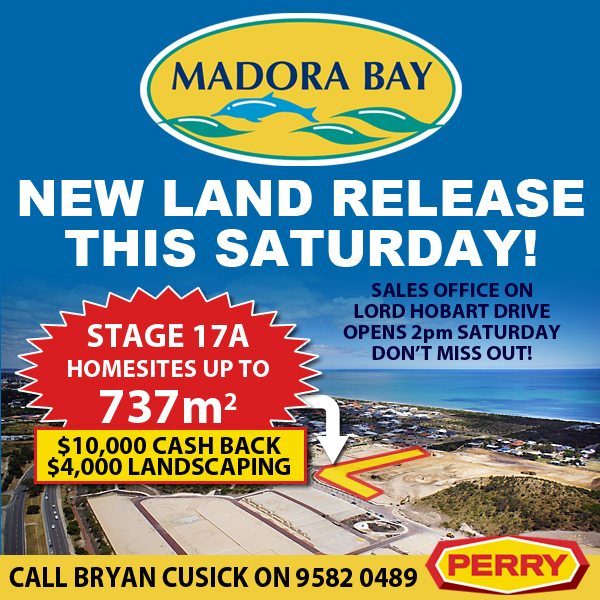 That’s why you should hurry in to make sure you don’t miss out on Madora Bay’s new release of large blocks on the beach side of the road. This Saturday, Stage 17A will be released consisting of 15 fully serviced homesites up to 737m2. Blocks of this size are a rarity and they are expected to sell quickly. As an added bonus, the Madora Bay Partnership is offering generous early building incentives of $10,000 cash back and a $4,000 landscaping package. Located just 10 minutes north of Mandurah, Madora Bay offers its residents an idealic lifestyle. The pristine beaches are perfect for swimming, fishing, surfing and boating, and the new surf lifesaving club just down the road is a great community hub. There are plenty of safe local playgrounds for the kids as well as a quality childcare centre right at the entrance. Access to a choice of public or private schools, shopping facilities, public transport and the freeway entrance also add to Madora Bay’s attractiveness.